Product Description: Vitamin E is a powerful antioxidant that helps protect our body from free radical damage. 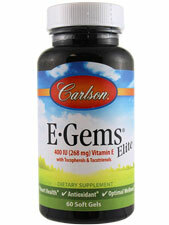 E-Gems Elite blends the entire vitamin E family, including eight forms of tocopherols and tocotrienols. Other Ingredients: Soft Gel Shell: (Beef Gelatin, Glycerin, Water), Sunflower Oil, Soybean Oil. Suggested Use: Take one soft gel once or twice daily, at mealtime.